Carlson has been with the Skyline Exhibitor Source team for almost 25 years, beginning at Skyline Exhibitor Source's Manufacturing International Design Center in Eagan, MN where he worked in Production, Receiving/Warehouse, Graphics, Skyline Digital Imaging, and Project Management/Big Booth. During his time there, Carlson was a member of the team involved in building a New World Project with the University of Minnesota, 3M, and Greg LaManns. For a time, Carlson worked at Tradetec Skyline in Chicago where he created a Business Plan for Trade Services (division of Tradetec), was responsible all IT implementation, and created procedures for their Services Business start-up. Skyline Exhibitor Source has provided Carlson with the opportunity to achieve many accomplishments in trade show management in Nashville. Some of his projects include: creating their services operations, building an extensive exhibit management program, and transforming a former medical manufacturing plant to their current exhibit Showroom & warehouse. He also worked to develop procedures from the ground up for many of the company's departments. A sought after manager and teacher of his business practices, Carlson has created seminars to train other dealers to implement processes and procedures, including an I&D Summit and a Services Manager Training Summit. "We are proud to announce the promotion of Aaron Carlson to the position of Vice President of Operations. We have been blessed with Aaron's expertise and amazing insight as a leader for many years now. 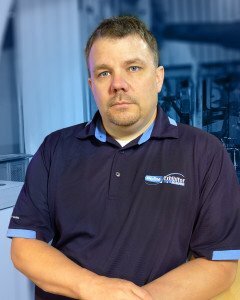 We are excited for all that Aaron will accomplish in this expanded role," said John Hamari, President of Skyline Exhibitor Source (www.esourcetn.com). Carlson stated, "I am truly honored to be entrusted with this newly expanded scope of responsibility. I am blessed to work with an outstanding team. I would quote Ronald Reagan when he said, 'Surround yourself with the best people you can find, delegate authority, and don't interfere as long as the policy you've decided upon is being carried out.'" Skyline Exhibitor Source designs and manufactures custom modular trade show exhibits in Nashville and Knoxville, Tennessee. Sixteen different systems are manufactured in-house, many of which integrate seamlessly with one another. These modular designs allow the company's clients to pick and choose the pieces that work best for them in any given situation, making Skyline Exhibitor Source exhibits some of the most versatile systems available. Skyline Exhibitor Source is part of the Skyline global network consisting of nearly 100 design centers in North America and more than 1,500 team members worldwide. The company offers trade show display rental in Nashville and Knoxville, exhibit sales, custom-designed graphics and service support. To learn more about Skyline Exhibitor Source visit them at www.esourcetn.com. About Skyline Exhibitor Source: Skyline Exhibitor Source has been committed to designing trade show exhibits and corporate environments for over 25 years. Located in Nashville Tennessee, the company thrives with a results-oriented approach to problem solving for trade show displays and corporate environments. Clients regularly note that they value the “knowledge and expertise” that Skyline Exhibitor Source provides and that it is the most valuable part of their service offerings. Experience, ethics, award–winning designs, trade show management, and rental options are all part of the package that one will receive when working with them.